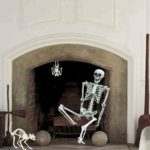 Some people find a bird stuck in their chimney or fireplace and panic. 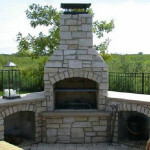 Others search for a solution such as the ones we offer for removing a bird stuck in chimney or sitting in a fireplace. The most creative come up with their own unique solution for a bird stuck in chimney. That’s what Nic did when faced with a bird stuck in chimney. She’s a solutions-oriented student from Sweden with a lifelong passion for both art and animals. Always one to help an animal in need, she created a clever solution for rescuing a bird in her chimney. Nic invented a Bird Elevator to lower down through the chimney, allow the bird to step onto it, and then safely raise the bird elevator up the flue to release the feathered critter. 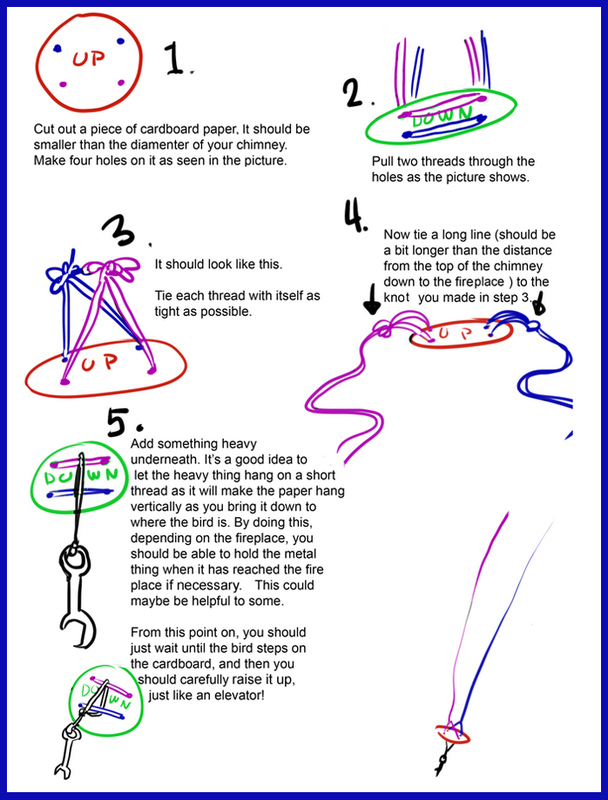 And Nic was generous enough to create how-to instructions for the Bird Elevator for us to share with you on FireplaceMall.com. 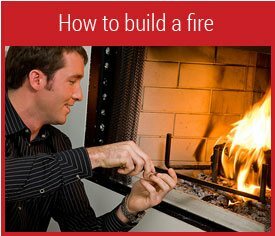 A piece of cardboard the bit smaller than the inside of your chimney flue. Scissors to cut the cardboard. Hole punch or something else to make the 4 holes in the cardboard. Light weight string or thread. Heavier weight string or light weight rope. A weight. Nic used a wrench. The willingness to go up on the roof. 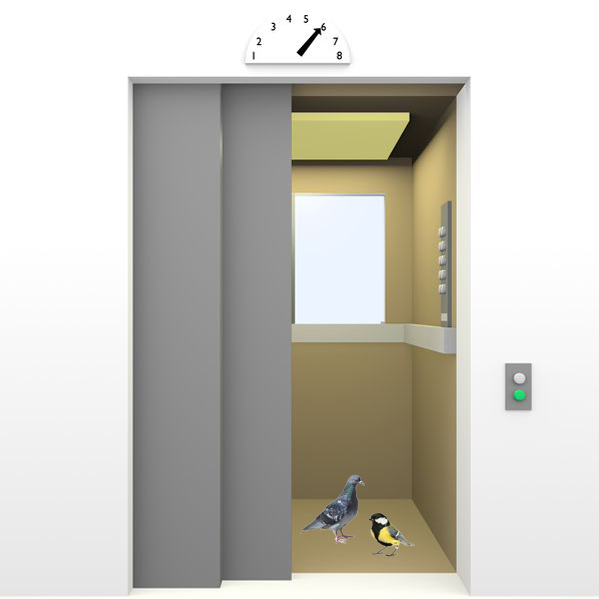 The patience to wait until the bird settles onto its “elevator” and then slowly to raise the elevator up the flue. Now that your chimney is bird-free, you will probably want to insure that no more birds try to enter your chimney or fireplace. 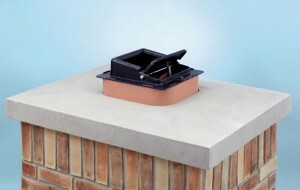 The solution for that is to install a chimney cap. 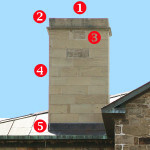 A chimney cap has screen mesh sides and attaches either to the chimney flue or to the cement crown on top of your chimney. The screen mesh allows smoke and gases from your fireplace to exit your home without allowing birds or other animals to enter. 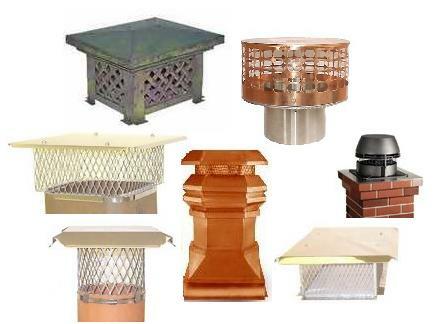 If you also want to prevent bees, wasps and other flying insects from entering your home through your chimney, you will need a top-sealing damper, either with or without a chimney cap. 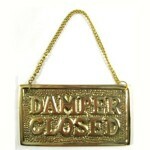 The top-sealing damper attaches to the very top of the chimney’s flue and is closed except when you use your fireplace. 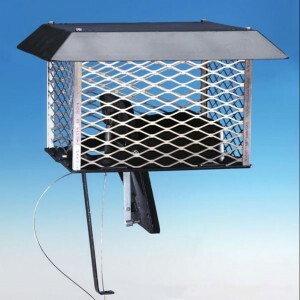 If you use Nic’s style of DIY Bird Elevator to rescue a bird from your fireplace or chimney, please let us know in the comments how it went! Last updated by Susan at May 26, 2016 .